In 1999, the City of Chicago created a buzz when it hosted the Cow Parade public art exhibit. Fiberglass sculptures of cows were painted in various themes and placed all around town, and after several months on display, the 300 works of art were auctioned off to generate revenue. It was the first such exhibit in the United States and generated millions in tourism and for charity. Since then, it seems like every city or cause has created a fiberglass statue of its own. Anchorage had wild salmon; Buffalo, of course, had its mascot; Pensacola paraded pelicans, Bennington, VT had Moose and Cleveland had guitars in honor of the Rock and Roll Hall of Fame. Locally, we currently have turtles on exhibit to promote (and raise funds for) a new turtle exhibit at the aquarium. If your organization had the opportunity to create a fiberglass sculpture, what icon would it represent? 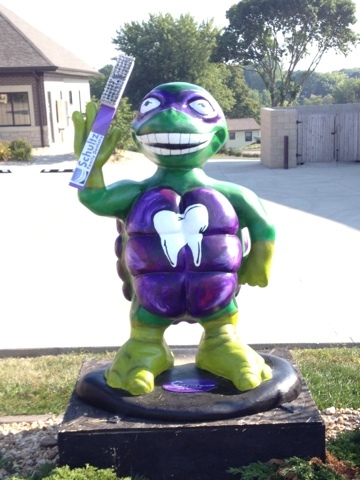 For schools or sports teams, it is easy to say “the mascot”, but think a little deeper. What symbol represents your public image and what you’d like to be known for? Maybe there is an opportunity to add a three-dimensional aspect to your storytelling. I was at the grocery store this week and picked up a bag of green grapes. 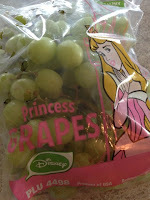 Much to my surprise, these were Disney Princess Grapes, complete with the Disney logo and picture of a princess outside her castle! What?! I wondered: Is the newest celebrity spokesperson a Disney princess? Did the grower need to pay Disney to endorse their product so they would sell more grapes or did Disney seek out grapes as a wholesome product to associate with? Is this the only way to get real-life little princesses to eat their fruits instead of candy? Once I understood it, the Disney/healthy living connection makes sense. What partnership could make sense for your organization? Think of how you can use your reputation, clout and brand to advance a cause that is near and dear to you. During the past few weeks, we discovered a couple of small mistakes in our office. A Shutterfly book with a caption that doesn’t correspond to a picture. A batch of routine letters that were barely smudged during printing. An order of note cards that came in with an ink color that is a few shades off from the official tone. All these scenarios introduce the need for a judgment call: do we save the time/money and “let it go” or do we utilize scarce resources to redo something that would probably be insignificant to most people? And where do you draw the line: fixing things that are seen by an external audience? Paying extra attention to items directly related to your branding? Leaving alone mistakes that do not alter the substance of the message? Putting environmental interests above reprinting for perfection? I guess as a general rule of thumb, if I catch a mistake, I take steps to correct it. Reprint the book rather than have a year of visitors wonder what else we are sloppy about. Use the note cards as scrap paper rather than let the brand standards become muddled. It is inevitable that mistakes will happen that you never see so you can’t correct. With that in mind, when you have the opportunity to do it right, fix the ones you catch. It would be hard to miss the fact that today is the 50th anniversary of Martin Luther King Jr.’s “I Have a Dream” speech. Magazines and news stories are full of reminiscence about the historic oratory and the state of race relations in the country today. Certainly the speech was significant and a half century is an appropriate milestone to engender reflection and assessment of how things have changed. But as with anything, no matter how powerful and wonderful the speech may have been, it was still one event in a long series of events that changed the course of history. It is at times like these that pundits fixate on MLK’s speech and its impact, but forget the decade of events that led up to the event and made possible the March on Washington for Jobs and Freedom. Reverend King would likely not have been able to eloquently articulate his dream to 250,000 people on the National Mall had it not been for Rosa Parks in 1955, the Montgomery Bus Boycott in 1955-1956, school integration at Little Rock Central High School in 1957 or the sit-ins at the Woolworth’s counter in Greensboro in 1960. Each of these events played a part in drawing attention to the cause and empowering people to stand up for it. As one person stands up and passionately shares the story of their dream, remember that it evolved from many before him and requires many more to execute it. When you acknowledge milestones or celebrate successes in your organization’s history, take care to put the event in perspective. You can honor the one in front of the microphone for oratory genius, while simultaneously remembering that dozens or hundreds of others — many no longer at the institution or ever acknowledged for their role — conspired to make the big event possible. How times have changed. Now students just moving onto a college campus take all of the above. Vans and SUVs are loaded to the ceilings. Students come in multiple cars or with trailers. And most of it involves items other than clothes! In selected cities, Target is hosting after hours rallies specifically for college students. They ran an online campaign, showing a decorated dorm room at Bullseye University where students were able to point and click on the items they wanted. Target is putting glass enclosed rooms on five campuses to showcase their college dorm products. Students now come to college with enough accessories to outfit a small apartment. College is expensive enough without the unnecessary pressure to “decorate” a dorm room with anything beyond posters stuck to the wall with sticky putty. Encourage your students to learn their first lesson in college by ignoring the peer pressure to be a mini-Martha Stewart. Think about what could fit into a steamer trunk and suitcase and leave the rest at home. Today is the first day of school for our students and, undoubtedly, for many others across the land. While college students may be dreading the return to studying and exams, the most eager students out there are those who are just beginning Kindergarten. Some students today have ambitious goals with answers ranging from a paleontologist, an app maker and the President, a dancer and a doctor, to a dentist. Others have more modest career goals: a deer hunter, a lifeguard, a dish washer at the restaurant and a cement truck driver. They also have fantasy professions in mind: tooth fairy and Minnie Mouse, a mermaid, and a Ninja. I think if you would have asked me when I was five, I think I would have answered “a teacher.” Think about your answer to the question, “When I grow up, I want to be a…” No matter where you are in life, it’s never too late to take a step in that direction. Since I ranted about poor service yesterday, today I will give equal time to the good service I received this week. I went into our Hallmark store to get a card for my niece who is starting Kindergarten. Typically, Hallmark has cards for everything, and I was confident that I would find the perfect message wishing her well as she embarked on this great new adventure. I was wrong. I thought the only one to refer people to their competitors was Santa in the Miracle on 34th Street. Especially when she had a satisfactory substitute, it was generous to try and make me happy instead of just satisfied. It turns out that I did not have time to go to Target that day, so I purchased her original selection. But instead of feeling regret about its generic message, I was glad to give this woman my business. What is your goal when dealing with customers? Are your staff members just completing transactions or are they aiming to delight and serve — even if it means sending people elsewhere? If you think about the long term relationship instead of the momentary sale, the gold crown service at Hallmark will be the true winner.